Submitted by reader Daniel Regan Jr.
- Oney Lorcan defeated Andrade "Cien" Almas in a decent opener. - Billie Kay & Peyton Royce defeated Liv Morgan & Aliyah when Kay pinned Morgan. There was a funny moment during match as Kay and Royce were acting as heels and quickly tagging back and forth. The ref ordered "Bayley" to get out of the ring, and Kay was none too pleased, saying "it's Billie" and shaking her head. The Revival got the first big pop but the crowd came down during the match. Moss took the fall. - Tye Dillinger defeated Bobby Roode and Elias Samson when Dillinger pinned Samson. No huge spots, but they all looked good. Not much singing along for Roode which was disappointing but not surprising from the Japanese crowd. They were screaming equally for Roode and Dillinger throughout. Samson was the obvious fall man choice and played the pure heel throughout. The crowd started to incorporate counting 10 during the match. - William Regal came out to a warm response, and he brought out Hideo Itami to huge reaction. They both said nice things about Japan and the crowd. Itami was making them laugh when he started speaking to them in Japanese. The crowd popped huge for Asuka but came down as Jax dominated the match on offense. In the end, Asuka won after a kick to Jax's head as she was on her knees. This stole the show and the crowd was hotter for it than any other match. All four had wonderful showings. There were dueling chants for the teams with Tozawa over huge. Tozawa took the fall but he and Tajiri got the curtain call. 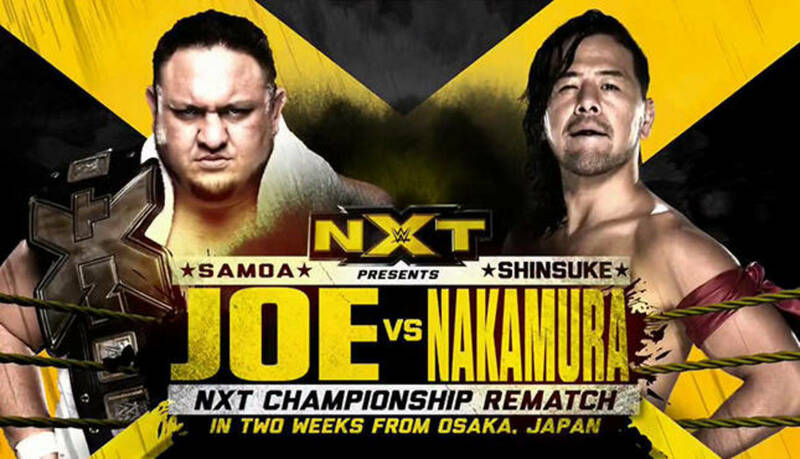 Nakamura was over huge as expected, but Joe earned respect from the crowd. They teased the Muscle Buster but Joe never got it off nor did he get the Coquina Clutch on at any point either. Nakamura missed a spot right before the finish. He hit the Kinshasa after a few failed attempts to get the win. The crowd popped huge, but the last bungle deflated the moment somewhat. Nakamura posed as the crowd applauded and the show ended.